Tickets to the largest, liveliest and most entertaining whisky festival in the world, the FNB Whisky Live Festival, are now on sale through Webtickets, which can be found on the festival’s website, www.whiskylivefestival.co.za. This year, the festival will offer something for everybody over the age of 18, including many returning favourites such as the fun and educational whisky workshops plus many new interactive innovations. More than 19 000 people are expected to attend the festival, which is taking place at the Cape Town International Convention Centre from November 2 to 4, 2011, and at the Sandton Convention Centre from November9 to 11, 2011 (18h00 to 22h00 daily at both venues). “We’re going to show Cape Town and Johannesburg just how much fun it is to unravel the mystery of whisky in a responsible, and educational way,” adds Karen Chaloner, co-organiser of the festival. * The Compass Box Art of Blending Zone: Follow a unique tasting session with a do-it-yourself blending experience, exploring products from Compass Box. Understand the methodology, concepts and results, and create and name your own blend. * The Glen Grant Distillation Zone: Dave Akker (Cape Town) and Dennis Malcolm (Johannesburg) will host three interactive informal workshops each night, helping visitors understand the significance of copper stills. * The Macallan Aroma Zone: Experience The Macallan Aroma Box, created in partnership with renowned perfumier Roja Dove, and learn to identify and describe key aromas in The Macallan’s range. * The Pick n Pay Canapé and Whisky Pairing Zone: Let international food and whisky guru Martine Nouet show you how to pair whisky with canapés, giving you the ideas you need to create the perfect whisky cocktail party in your home. * The Schweppes Art of Whisky Cocktail Making Zone: Learn the art of cocktail mixing with Schweppes’ premium range of mixers - what would a cocktail be without them? Push your creative boundaries and make your own cocktails to show the purists a thing or two! * The Valpré Water and Whisky Sommelier Experience: Learn how much Valpré Spring Water to add to your tipple, how to pour it into your glass, and what guidelines to follow to “release the serpent” (the esters and floral notes previously held captive in the dormant aged liquid). * Whisky workshops: The FNB Whisky Live Festival Whisky Workshops regularly sell out thanks to the opportunity to taste unique whiskies generally unavailable in the Tasting Hall or even in South Africa. More than this, these one-hour tutorials led by whisky experts with a knack of explaining whisky jargon in simple everyday language, will completely revolutionise the way you taste and value whisky. Expect workshops from BenRiach, Glenfiddich, international whisky writer, Dave Broom, and Rob Allanson, editor of Whisky Magazine, plus many more. * The Volvo Whisky Lifestyle Lounge: Volvo is the official transport partner of the FNB Whisky Live Festival, and will provide the perfect setting for entertaining clients, networking, or even meeting with friends in a relaxed and stylish atmosphere. An added bonus: The Whisky Boutique Bar will include whiskies that are unavailable for tasting in the main Tasting Hall. Look out for the new accommodation, chauffeur drive plus Volvo Hospitality packages on the website. * The ultimate guided tour: The popular Connoisseur’s Experience, ‘The Ultimate Guided Whisky Tour’, sells out within hours of tickets opening each year. This year promises to be no different. Newly sponsored by Volvo, this experience offers festival goers the opportunity to be chauffeur driven to the festival in a luxurious Volvo where you will then join a guided tour to savour rare whiskies not widely available. * Get your very own FNB Whisky Live Festival Special Bottling, a hand-filled single cask bottling of The GlenDronach 1990 vintage, 21 years old. * Taste some of the 180 local and international whiskies on show, and seek out some of this year’s “hidden gems”, including Bruichladdich, the Kilchoman Winter 2010 Release, the Balblair 1989 Vintage and the Balblair 2000 Vintage, plus some interesting ranges from Jura and Dalmore. * Make a bid for one of the world’s oldest bottled single malts, the limited edition Glenlivet 1940, which will be auctioned at the festival, with all proceeds going to the Foundation for Alcohol Related Research (FARR). * Book a private tasting at Black Bottle, Three Ships, Bain’s Cape Mountain Whisky and Bunnahabhain. * Experience Great King Street Artist’s Blend, which will be launched to South Africa at the festival by Compass Box. This is the first blended Scotch to be bottled exclusively in a 50cl format, and offers a compelling alternative for malt whisky enthusiasts and whisky novices alike. * Glenmorangie’s most luxurious expression to date, Pride 1981, will be unveiled at the festival. Pride 1981 is an extremely rare, limited edition, with only 1,000 bottles available worldwide. Visitors to the festival will be able to view and purchase this masterpiece at the Glenmorangie stand hosted by global brand ambassador Karen Fullerton from Scotland, alongside Niel Hendriksz. * Sample the Highveld’s first ever single malt, with Moritz Kallmeyer, owner and master distiller of Draymans Highveld Single Malt Whisky. * Savour a wee dram from Wales’ only whisky distillery, Penderyn, and meet distiller Gillian Macdonald, to learn what distinguishes Welsh whisky from its cousins elsewhere in the world. * Invited guests will slip away into the sanctuary of The Glenlivet Library where Ian Logan, international brand ambassador for The Glenlivet, will host limited edition tastings. * Watch out for the accommodation and chauffeur drive packages – ideal for client entertaining and making a night out with friends. 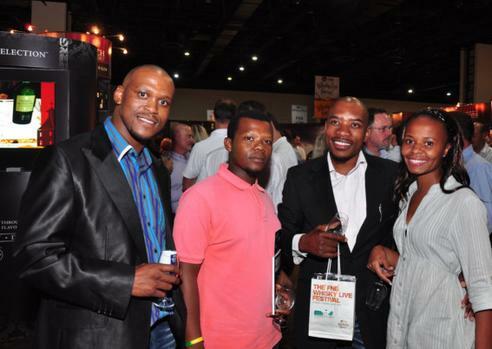 * The FNB Whisky Live Festival promotes responsible drinking. No persons under the age of 18 years old will be allowed into the Tasting Hall. Designated driver tickets are available with discounted food vouchers and a bottle of Valpré mineral water included in the ticket price. Various chauffeur drive services and drive responsibly initiatives will be on hand to ensure that everyone in your party is able to have a good time and a safe journey home. Part of the ticket proceeds will continue to be donated to The Foundation for Alcohol Related Research.